I'm going to confess something a little silly here: I like organic hand lotion, but not for any serious important reason like paraben-free formulas comprised of natural, non-carcinogenic ingredients. No, I prefer them because they tend to smell less obnoxious and artificial than their conventional counterparts. Superficial? Perhaps. But you'd be picky about nice-smelling hand lotion too if you're constantly washing your hands with drying office bathroom soap. Trust me, when you reapply lotion as often as I do, you get choosy. A couple months ago I was given a tube of Consonant Body's Intensive Therapy Organic Hand Cream ($20 for $125 ml; available on the Consonant Body website or at BeautyMark) and I've been hooked ever since. 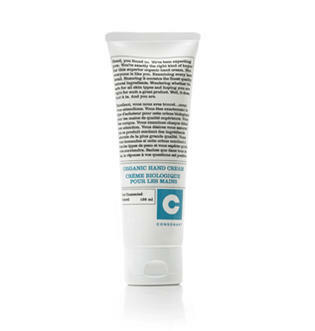 This rich cream moisturizes deeply and contains vitamin E, chamomile, rosemary, and ginseng extracts. It's unscented and gentle and feels positively luxurious when you massage a dab into parched hands. 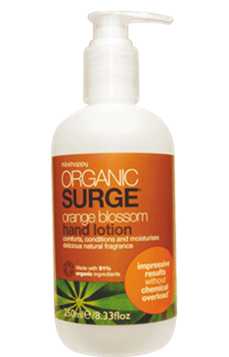 If $20 is more than you're willing to spend on hand lotion, there's always Organic Surge Orange Blossom Hand Lotion ($7-8 at Shoppers Drug Mart). This affordable drugstore find comes from a British company and uses 90% naturally derived and/or certified organic ingredients. But the best part is that Organic Surge's lightweight, fast-absorbing lotion "smells like orange Creamsicles," as one former coworker put it. The scent is citrusy with a light creamy touch of vanilla. I had this on my work desk for a year and a half, and every time I put some on I thought of orange smoothies and smiled to myself. What's your favourite hand lotion? I'm using the Nivea Q10 anti-wrinkle hand cream right now, because my classmate used it and I found it absorbed really well. It's not quite as thick as I would like though-my cuticles and the skin around my nails is incredibly dry and nothing seems to heal them properly. I've tried that Organic Surge one as well, and it did smell really great. Right now I'm trying out LUSH Handy Gurugu. I'm liking it so far but I wish it came in different package. The pot it comes in is very clunky and won't fit well in some of my bags. It's one of those hand creams that better left at your desk or on your nightstand. I have 2 favourites. One is just 100% shea butter. I usually get it a l'Occitane. It actually has no scent but is SUPER moisturizing. The second one is Aveda Hand Relief. It's really rich and has a light spicy scent. YUM! I'm so glad that you presented an alternative to the Consonant Beauty hand cream! I've been meaning to try it, but it is a little on the pricey side and my student budget really cannot justify the price tag. Organic Surge it is! I really love good old Glysomed. It's very reasonably priced and I find it moisturizes incredibly well. I also like the tea-like scent, not too overpowering! The Consonant hand cream is amazing. I might cry when I run out of sample.